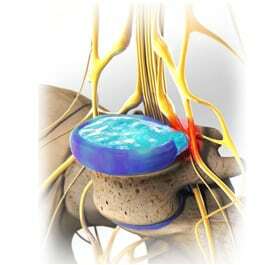 The spinal disc is a cushion that sits between each vertebrae of the spine. What happens with a ‘herniated disc’? 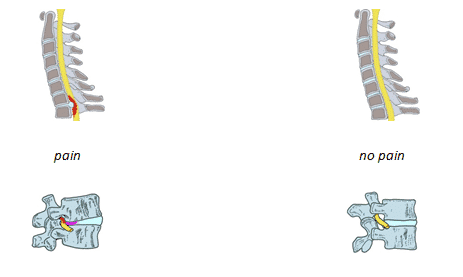 As the spinal disc becomes less elastic, it can rupture. When the disc ruptures, a portion of the spinal disc pushes outside its normal boundary–this is called a herniated disc. When a herniated disc bulges out from between the vertebrae, the spinal nerves and spinal cord can become pinched. Because of the nerve irritation, signals from the brain may be interrupted causing muscle weakness. How is the diagnosis of a herniated disc made? Most often, your physician can make the diagnosis of a herniated disc by physical examination. By testing sensation, muscle strength, and reflexes, your physician can often establish the diagnosis of a herniated disc. An MRI is commonly used to aid in making the diagnosis of a herniated disc. Almost 50 years of research, experience and technology have contributed to the development and evolution of specific conservative treatment for disc disease. One of the leading pioneers is Dr. James Cox, a leading researcher and well renown physician. To this day chiropractors, engineers and researchers continue to document its benefits. The latest findings of a federally funded research project at the National University of Health Sciences, Palmer Research Center, and Loyola Stritch School of Medicine/Hines VA show that Cox technique allows for safe and natural increase in disc height and nerve spacing. Dr. Tucker was fortunate enough to train and certify in this technique with Dr. Cox directly. Research articles include success with radiating pain, hip pain, sciatic nerve damage, cyst related pain, testicular pain and more. MRI pre and post treatment has revealed reduction in disc herniation size (JMPT, Vol. 19, no 9). According to another research project (Johnson, Arch Phys Med Rehabil 1981) less than 5% of patients with low back and leg pain require surgery. Making this treatment option a successful and more importantly, safe initial treatment option. In addition to a multitude of research, many of the individual case studies we have in our clinic continue to provide daily successes. Cases that are considered “surgical candidates” improve and reach full resolution. Specific Chiropractic techniques can re-absorb some of the herniated disc material. Dr. Tucker is certified in a post-gradual technique that is safe and gentle, which is geared to treat disc problems without drugs, injections or surgery. Cox Flexion-Distraction and Decompression is a non-surgical, doctor-controlled, hands-on specially designed chiropractic technique. This instrument permits the effective administration of flexion-distraction and decompression adjustment and manipulation. There is no twisting to this treatment.